Southwest Form, camphor, textured and stained, 200mm high x 140mm dia. 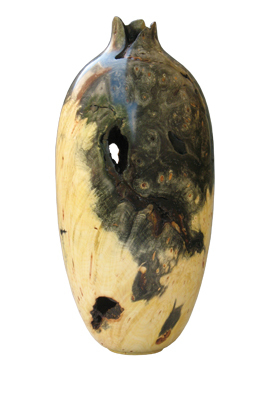 Tall hollow form in buckeye burl, 255mm tall x 115mm dia. 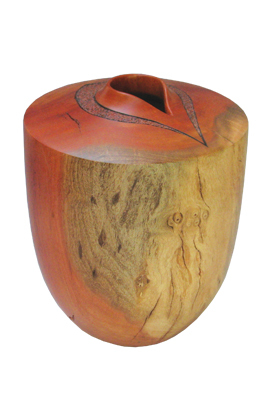 Hollow form in ironbark eucalyptus, 178mm high x 125mm dia. American turner Bill Haskell has an interesting background, as I discovered whilst compiling this profile with his help. Bill has always had an eye for creativity and creative expression. 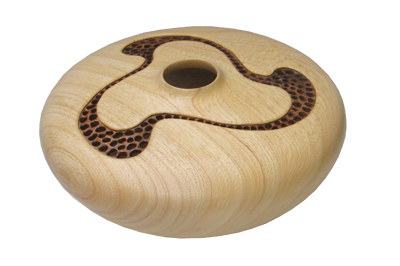 It was towards the end of his professional career that he really discovered woodturning, although having dabbled with it in junior high school, and hence his career as a woodturner began. I decided to start at the beginning aiming to find out more about this turner who produces beautiful items such as hollow forms, open forms and a selection of contemporary sculptures, all of which have beautiful grain figuring and some pyrographed and enhanced detail. I was a big fan of his work from the outset. Through carrying out this profile, I learnt that Bill is very behind the push in woodturning that has occurred over the last 25 years, and he says that he is very much a part of this creative direction. Bill grew up in Southern California, majored in economics in college, then went on to spend more than 30 years in the field of aerospace financial management. However, aside from his profession, he comments that he always had a strong interest in creative expression from a very young age: "I explored various mediums, such as woodcarving, metal sculpture and silver jewellery, but I always had an avid interest in working with wood and form. With an interest in woodworking and form, what a perfect fit woodturning provides," he says. Bill's first encounter with woodturning was in junior high school woodshop, where he turned a few bowls with somewhat crude technique and little instruction. Despite the primitive start, this experience intrigued him, and later in life a latent interest in woodturning was rekindled when he purchased a bench top second-hand lathe. "Once I discovered the world of organised woodturning, I joined a local woodturning club, where it became obvious that I had much to learn. After a club hollow form demonstration by John Jordan, I found myself excited by the process and possibilities of turning hollow forms. So this is where it all began," he tells me. Bill comments that he has found demonstrations particularly useful over the years, as they gave him the opportunity to learn from renowned professional and international turners who teach their techniques and woodturning principles, as well as design concepts. These have certainly been an invaluable educational source for Bill. In time, he became the club president, and further on, he became active in the American Association of Woodturners (AAW): "I was elected to the Board of Directors, and eventually became the president of the organisation for one year. I currently attend meetings of four local AAW chapters," he explains. I asked Bill about the type of work he produces and he points me in the direction of his stunning hollow forms, a variety of which can be seen in this article. He also says that sculptural forms interest him and some of these incorporate mixed media, such as a stainless steel rod and base to which the piece is mounted. These are particularly striking. When looking at his work I feel an overwhelming desire to reach out and touch the form as the surface finish appears to be so smooth and inviting. The figuring on all of his pieces is stunning and the way in which he manipulates the piece is done in such a way that this is shown off to the best of its ability. 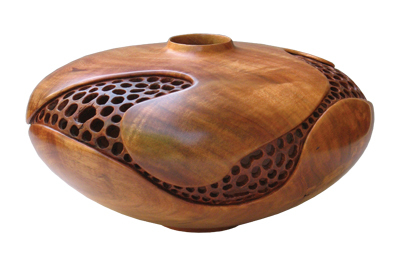 Many of his pieces are pierced and carved in places, often around the top of the form, or in such a way that the detail elevates the shape of the piece and runs with the natural grain pattern. All in all, his pieces, although coloured but in some cases ebonised, are stunningly natural. 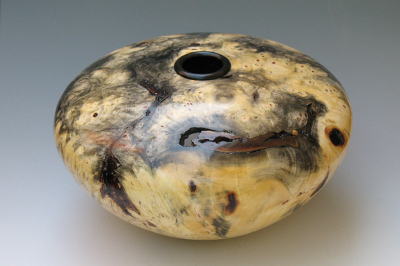 Bill comments that he does make the occasional bowl, platter or weed pot, but primarily he focuses on hollow forms. According to Bill, the best thing about turning is that new approaches and techniques are easily undertaken: "Turning offers me the ability to explore new avenues with relative ease and a minimum of invested time. From the initial act of cutting a turning blank from a log, to fashioning a pleasing form on the lathe, and then to developing a complementary design or surface treatment; the process of exploration and discovery is actively in play. That whole interactive process provides a very rewarding and fulfilling experience," he comments. Natural elements found in timber - imperfections to some - are often used to advantage by Bill in his work: "Such features as bark inclusions, unusual figure, distressed areas, spalting, natural edges and sapwood/heartwood colour contrast are often employed to achieve striking and unusual character in combination with complementary form," he says. 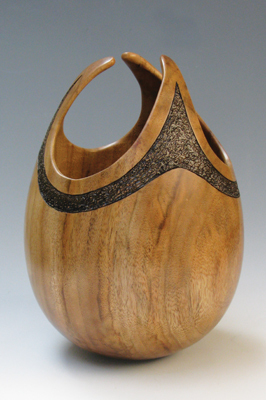 In his turning, Bill also seeks to explore form composition in turned objects, often with woods that offer rich figure, colour and unusual character: "While finished wood is a warm, sensuous, inviting, and a tactile material, creating a beautiful form in each piece is the primary objective. My ultimate goal is to create an appealing shape that is complementary with the distinctive quality of the wood used in each one-of-a-kind studio piece." In more recent years, Bill has used carved, pierced and textured designs to enhance his pieces after the lathe work is complete. Bill explains that in most of these cases, a less dramatic wood is used to minimise competition between the natural character of the wood and the enhanced design. Examples of his carved and pierced work can be found in his vessels with tuxedo and seedpod openings, as well as in his coral series and flowing ribbon carved vessels. I was interested to hear how long one of Bill's typical pieces takes to create and he informs me that work on the lathe normally takes between two to four hours, and then carving, texturing and/or piercing may take a similar amount of time or more â€“ this obviously all depends on the individual piece. "The recent trend has been to spend more time off the lathe than on," he finishes. So what inspires Bill? He tells me that he has always been inspired by the wonderful and successful work that so many makers create: "I got into serious woodturning in the early 1990s and I was immediately inspired, excited, and challenged by the technical and artistic possibilities of the emerging medium of woodturning." He explains that the opportunity to join this medium and create something that is fashioned with his own aesthetic and hands, was an urge he could not resist. Also, the huge potential for further growth inspires him to seek newer and creative approaches in his work both on and off the lathe. He goes on to explain that as a turner, he cannot help but be inspired by other woodturners: "John Jordan and David Ellsworth's hollow forms were particularly inspiring to me early on because their work showed the incredible opportunity that shape, form and surface design can bring to creating an aesthetically pleasing piece. There were many other turners who inspired me along the way, in particular the vast array of artists and craftspeople whose work is seen at AAW symposiums." Bill also tells me that he had the pleasure and richly inspirational opportunity to see the private collection of Dr Irving Lipton several times when he was alive. A few turning artists that come to mind early in his turning life, in terms of the utter magnificence of their work and how it impressed him, include Hugh McKay's one-piece grouped hollow forms and Frank E. Cummings III's exquisitely turned and carved work. 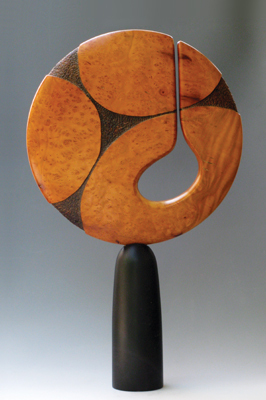 More recently, Curt Theobald's use of the elliptical form has inspired Bill to use that non-round form in a different manner, a concept with which he's currently pursuing and experimenting. form, plus the use of carving, piercing, texturing, pyrography and other surface treatments, I'm starting to create more appealing compositions." Bill says that his work has evolved to the point where he prefers to use wood with subtle figure, which will not compete with form or design elements, but rather achieve composition harmony and interest. When I asked Bill about methods he uses for promoting his work, he says that he primarily relies on galleries that exhibit his work, participation in local art shows, and several websites. A number of years ago, Home and Garden Television (HGTV) aired a segment on Bill's woodturning, which has since been re-shown a number of times. This has been one way to connect with interested collectors. Although Bill largely taught himself how to turn wood, he comments that he received a lot of guidance and support from his involvement with the American Association of Woodturners (AAW). 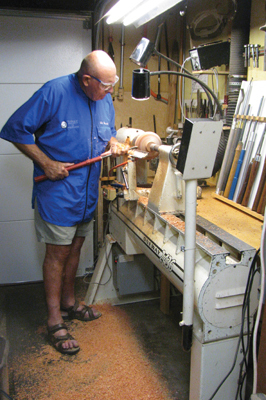 "During my career I started out as an AAW Chapter newsletter editor, then Chapter president, and then on the AAW Board of Directors for almost six years, where I served as secretary, treasurer, and president all of this involvement has provided me with a huge wealth of exposure to the woodturning world." In addition to his work with the AAW, Bill tells me that he has also attended a variety of turning demonstrations on local and regional levels, as well as AAW international symposiums over the years, all of which have provided him with a tremendous insight and knowledge about other turners, their techniques, and their approach to woodturning. So where does Bill create his fantastic pieces? He informs me that unfortunately, his home and property do not have room for a separate workshop, so he uses his garage for that sole purpose. This means his garage has not had room for a car since he got serious about woodturning 20 years ago. As far as special tools in his workshop, because Bill primarily makes hollow forms, the various hollowing systems he uses are absolutely critical; the kind of turning he does could not be accomplished without them. Aside from the lathe and related tools, the most important power equipment is the bandsaw, which is used to cut a variety of logs into suitable turning blanks. Recently, Bill says that the bandsaw has been used to cut a centre vertical mid-section out of a tall-enclosed form to create the elliptical forms on which he is now working. Dust extraction equipment and a disc sander also incur much use. In terms of work ethos, Bill explains that as he conceives and fashions his work, his goal is to achieve a balance between the characteristics of the material, the created form, and any design applied thereto that achieves a uniquely appealing composition with a clean, contemporary feel. When discussing the highs and lows of his career so far, Bill tells me that there have not been any lows in his woodturning journey, but three highs come to mind: "I would describe the major highs of my career as meeting and getting to know the artisans, collectors, gallery owners, and other members of the broader woodturning world, as well as having the opportunity to serve on the Board of Directors for the AAW, and now having a feature appear in Woodturning magazine." In terms of the future, Bill tells me that his plan is to explore new forms and treatments that create unique and appealing signature work. "As far as material goes, exotic woods are of little interest to me and I am now primarily using recycled wood from urban trees that had to be taken down." In addition to exploring new avenues with his work, growing in technique development that allows new and unique form exploration, is a continuing and future objective for Bill. If you would like to see more examples of Bill's work, it can be seen at LaFave Gallery, Utah, Fine Line Designs Gallery, Wisconsin, as well as on here and here.